In traditional Tarot, reversed cards – cards that appear upside down – are controversial: some readers give reversal a great deal of weight, while others disregard it entirely. This is especially true in the case of the Minor Arcana – indeed, many decks use pips instead of images and are identical in either direction, like our modern playing cards. Using Tarot in conjunction with the Muzoracle has been explored elsewhere here in the Addenda; generally, after the Muzoracle is cast a Tarot card is drawn for each position in the casting. In this context, the direction of the Tarot cards relates them to ascending or descending scales: upright Tarot cards travel upward in the direction of intention, while reversed cards travel downward as part of the flow of nature. Neither direction is inherently positive or negative. Reversed Tarot cards in Muzoracle castings don’t become their opposite or more intensified as they do in traditional spreads; they simply take on a different role. In fact, in the context of the Muzoracle, we don't even use the term "reversed" – Tarot cards are simply ascending or descending. Viewing Tarot through the lens of ascent and descent gives the Tarot deck quite a different feel, and makes an interesting study on its own. 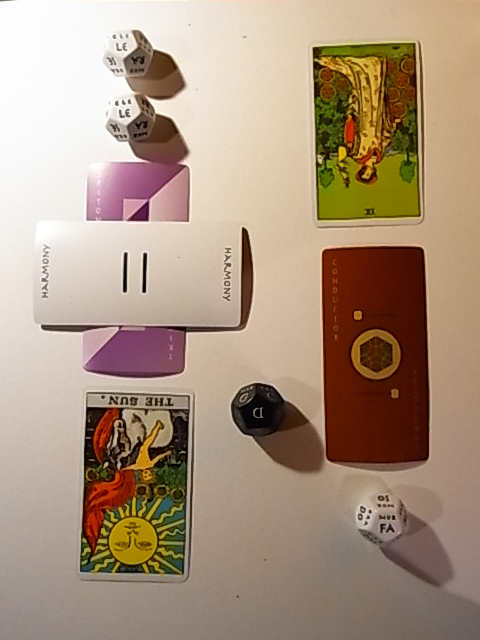 Things can become especially lively when, within a position, the Tarot card travels in the opposite direction of the scalepoint and its attendant Muzoracle card. In the example at top left, a Major Seventh of Brass was cast over the point of so, followed by the Six of Swords "reversed" drawn to the same position. While the Seventh of Brass is interpreted over so, the point of Challenge, the Six of Swords is traveling in the opposite direction, and is interpreted under ra, the point of Vitality: ra is the tritone, or “opposite” of so. Finding a scalepoint's tritone is easily accomplished using the chart below, which can be found as well on the foldout flap at the back of the Muzoracle Handbook – note so and ra, as found in the above example. Another example: at right we find a Tritone of Voices crossed with the Harmony Card under le, with the Sun traveling upward from the opposite direction, from "re." Thus we have the following dynamic: a pervasive sense of urgency regarding a relationship is weighing things down, while an ubiquitous optimism may be keeping the core of the problem from being addressed. In the following position, we find a Conductor of Percussion over fa, with the Nine of Pentacles traveling downward from... fa as well. Due to the ambiguous nature of tritones, the "opposite" of fa ascending is fa descending – same deal with ti, check out the chart. (If you're interested in the whys and wherefores of that, go here.) What we see with the Conductor is a time of real, physical leadership being revealed, coming to the fore; the Nine speaks of a relaxed, enjoy-life confidence needed in order to navigate a transition.